Click here for audio of Episode 942. Today, we ask medieval architects, "When is mathematics mathematics?" The University of Houston's College of Engineering presents this series about the machines that make our civilization run, and the people whose ingenuity created them. Suppose you're a contractor, and you're asked to erect a quarter-mile-long structure, as tall as a typical downtown office building. Then you're told you must design the structure as well -- that it is to be made of stone, no steel beams, no concrete -- that the only available power is at ground level, limited to horses, oxen, and maybe a three-horsepower water-driven saw. One more thing: you've got to do the job with no stress calculations and no set of working drawings. Sound impossible? Well, that's what scores of medieval cathedral builders did. We read a lot about cathedrals, but we seldom weigh them as engineering construction projects. In fact, they took remarkable coordination of people and materiel. The master mason was in charge. He was architect and builder rolled into one. He often directed a work force numbering into hundreds. But he also worked among his people. He cut stone and installed plumbing. That puzzles us, wed as we are to the notion that academic and manual knowledge don't mix. That's a mistake! The subtle grace of the Gothic cathedral touches us powerfully on so many levels. But that grace is vested in engineering design. Those barrel vaults, flying buttresses, Gothic arches, and spiral stone staircases had to be born of mathematics. The building is the geometry text. The master mason, with his fingers touching stone, used stone to express geometry. 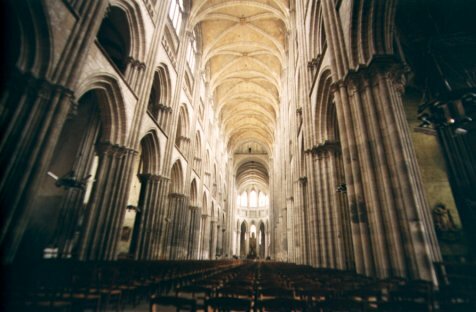 If mathematics is the symbolic expression of magnitude, that's what the cathedral itself is. The balance of mass and space goes by square roots of 2 and 3, and the so-called Golden Section. Medieval iconography regularly shows one mathematical instrument in the hands of the mason -- a pair of dividers. When medieval artists show us God, He often appears as the Master Craftsman, holding a great pair of dividers. With dividers and a carpenter's square alone, you can prove the Pythagorean theorem, and you can create any of those seemingly sacred proportions. The cathedrals were not so much designed by mathematics as they are mathematics. They are mathematics that flowed straight from the mind's eye to the fingers of masons who built them. The literature on this subject is too vast to summarize. However, the source whose rich illustrations got me thinking about this episode was: Coldstream, N., Masons and Sculptors, Toronto: University of Toronto Press, 1991. I am grateful to Rennie Goyert, UH Architecture Department, for his counsel.